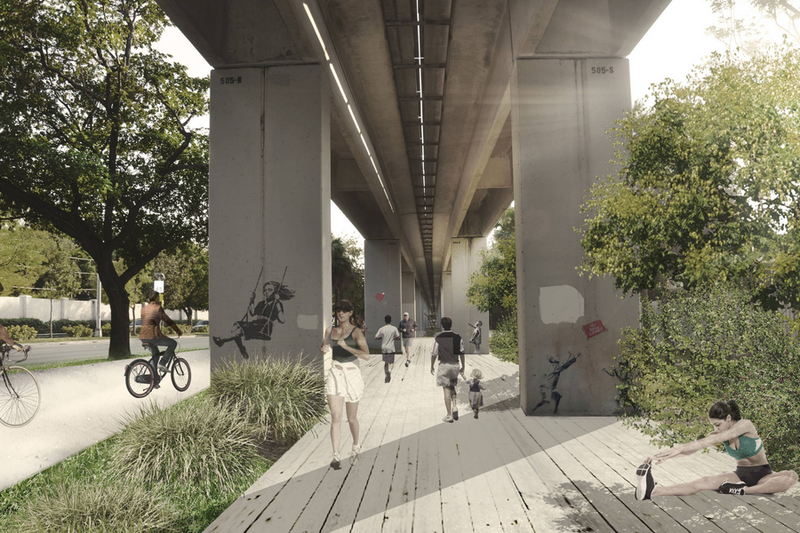 In Miami, the Underline would provide a path for pedestrians and bike riders beneath the Miami Metrorail. James Corner Field Operations, the firm known for designing the successful High Line linear park in New York City, just got hired by Miami-Dade County to be the master planner for the county’s proposed Underline. The Underline would be a 10-mile corridor underneath the Metrorail from the Miami River to Dadeland South. It would have space for pedestrians, bike riders and recreation. The High Line, a park built atop an abandoned elevated railway that runs from Little West 12th Street all the way north to 34th Street in Manhattan, is the inspiration for the Underline. Philip Aarons, who heads the group that supported the High Line, spoke about its success at a University of Miami real estate conference in February. He highlighted its $2 billion economic impact and the 4.5 million visitors it attracted in 2012. The University of Miami School of Architecture created the preliminary renderings. High Line designer James Corner Field Operators was selected by Miami-Dade and Friends of the Underline out of 19 applications. Its preliminary design is due in September. Sign up for New York Business Journal’s free email newsletter delivering exclusive news scoops and local business intelligence.